She came back and told me it's a known problem with AOL on the BT network or something and the only fix in place would be to be migrated or moved over to an LLU network or go to their line rental or cancel. There was no date for LLU and no line rental either, if they were I'd still be going anyway. She said she could book a callback from the senior support team there to see if they could resolve the problem. But after months of this problem I couldn't be bothered. I wasn't in any contract so asked for my mac which I should get in the next few days and then I'm off to BT. I googled this problem which brought me here so thought you might want to know. Re: Slow Speeds... Goodbye AOL. Basically if you're on a small exchange with no LLU options, then it's likely you're going to suffer slow peak times whatever your ISP. 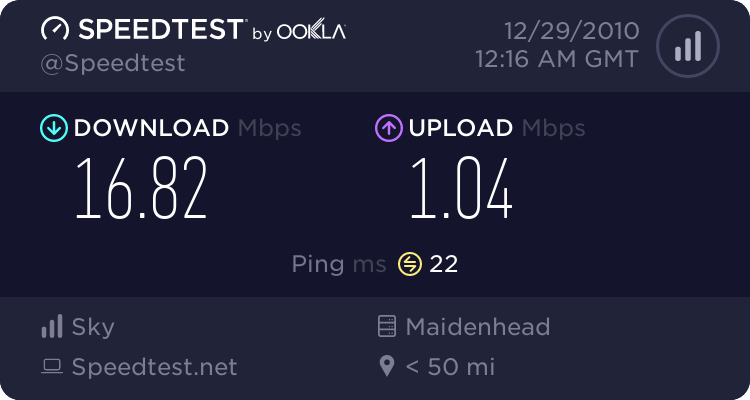 The government goes on about getting at least 2Mb broadband to smaller areas by a certain date, but they just mean synch speeds. I reckon it'll be years before rural areas actually manage decent speeds at peak times, whilst more and more people in urban areas are happily enjoying speeds of 8Mb or more, even at peak periods. Just another example of the gap between rural and urban areas. Yep, off to BT too! I know there's probably as many folk here queuing up to slag BT as there are AOL, but at least I'm going to be paying less than half AOL's price for the pleasure!! And supposedly at a faster speed although time will tell on that one.